I promise I'll get to it soon. Goldrake seems fine. It seems just a little thin in the first frame. One of the hardest due to having SEVEN HEADS. Why do we have this Pokemon again? Yeah, they're kinda sucky, but again, this one's hard. It's hard to make out, but understandably so. A great attempt and definitely usable. This seems a little small, considering that it's supposed to be on scale with Typhidna and is much smaller. Lengthwise, isn't it smaller than Goldrake? It's recognizable enough though. You did a great job of making it look much less squished. However, it still looks kind of small. Look at the Seviper icon on the first page of this topic. It's way bigger. You have 32x32 pixels of space to work with, and you're using 22x24. You don't need the fill the whole space, but you're filling less than half of it. Last edited by ImmunityBow; 03-27-11 at 01:27 PM. Wait. Do we need a Light-type TM/HM recolour? What are we talking about here? I gave him a type icon for Light. I'm talking about a TM sprite. Basically a light yellow disc. If it isn't done, I can do that quickly. Just one thing: the TM sprites (and item sprites in general) were introduced in FR/LG. Since Ruby and Sapphire came BEFORE then (and since Topaz is programmed using Ruby), would we be ABLE to use item sprites? The game supports an icon for each item, and Ruby refers to the programming language its written in. The kit supports up to Gen IV. Ruby the programming language has nothing to do with Pokemon Ruby version. It's just a coincidence. Ruby is used to program many not video game related things. Ah, OK then. I figured that it meant Ruby as in "pre-Emerald and other Gen III games" . And I'm pretty sure the HMs have a spot on them like this (but it's hard to see). They look different. Aside from the obvious transparent instead of white. I didn't change them at all besides that.. I'll open both in photoshop to confirm. more than likely, it was a trick of the eyes, in which the difference between the white, and transparent backgrounds appeared to change the actual sprite, when, in affect, it wasn't at all. Okay, I'm not much of a spriter, but I attempted my favorite new Pokemon in topaz's icon. I think it looks too much like the Poochyena I was referencing. It does look too similar, but you definitely have the right idea. One thing you can do is change the legs a bit more, maybe bending them for one of the two frames, and slimming down the head ever so slightly is another. Sure, I'll try that when I get home from school. I couldn't fix the head without it looking like a mess, so instead I made the first pose a little lower to the ground, barking, sort of, and the second with the ears cocked a bit, although that doesn't look too great. Actually, aside from a slightly too big snout, it looks fine. Have you tried animating it, yet? For said snout, i'd try making it a little more straight, before curving up into the face, instead of steadily growling larger to meet up with the top of the head. I actually have not tried animating it yet, any recommended GIF editors? sorry, I don't know any, but they shouldn't be too hard to look up on Google or something. You don't have to worry about animating it. RPG Maker takes the frames, not the animation. But for future reference, I don't know of any freeware gif animators. It's pretty sad. I ended up using Illustrator to do it. Edit: And by Illustrator, I meant ImageReady. Last edited by zeroality; 04-12-11 at 02:47 AM. I remember there was a 30 use free trial one called Easygifanimator but that was years and years ago so I don't know if it's still there. Can this work for Ampure's overworld sprite? I just did the front first, just in case no one liked it. It looks good, but I would prefer that you don't work in the enlarged size. 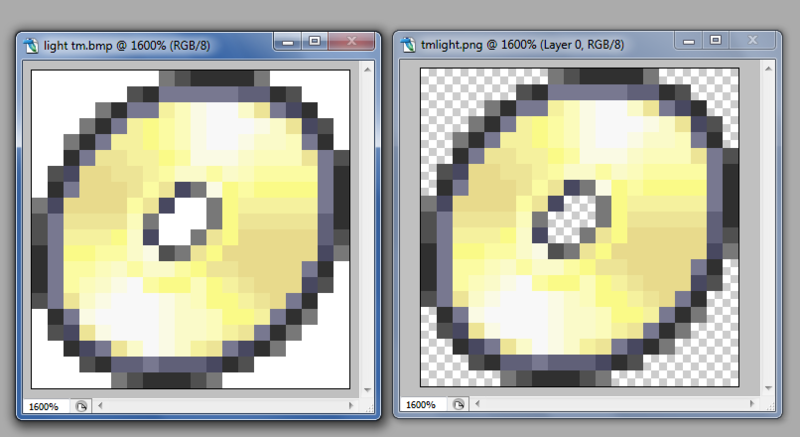 I prefer to see the sprites in original size to check for smoothness issues and other things, then double them up later.